I was only 8, going on 9. My sports consciousness was not yet developed. Although the New York Mets had won the World Series in 1969, the New York Knicks had won the NBA Championships in 1970, and the New York Jets won the Super Bowl in 1970, I don’t have any memories of those amazing moments in New York sports history. It was chess that first got my competitive juices flowing. It was July, 1972, and before the Munich Olympics took center stage, the biggest global “sporting” event of the year was the World Chess Championship. Yes. Chess. I owned and treasured this book as a kid. 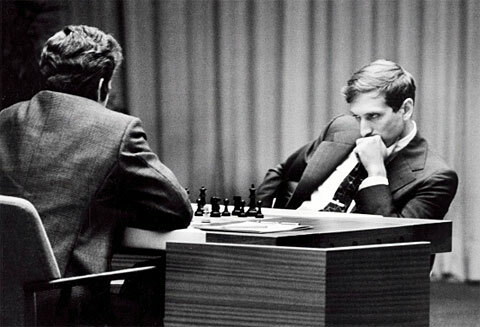 Bobby Fischer was taking on Boris Spassky for chess supremacy in Reykjavik, Iceland. But it was more than a chess match. It was the Cold War, and the 1972 championship featured an opportunity for a maverick chess savant from Brooklyn, New York, Bobby Fischer, to take down the best chess player in the Soviet Union, and thus the world, Boris Spassky. I had learned chess from my father and I played games with friends at schools, so I was proficient enough to follow along. But chess players weren’t the only ones tuning into public television to watch two people sit at a table and not move most of the time – a good part of the American public were as well. Why? Because it was democracy vs communism, capitalism vs socialism, America vs the Soviets. It was not just my sports consciousness that was switched on, it was a political consciousness. Like everyone around me, I wanted the American to beat the Russian. Bobby Fischer was my genius boy from New York. I had his book, Bobby Fischer Teaches Chess. I even went to chess classes at the famed Manhattan Chess Club where he had played. I just watched the film, Pawn Sacrifice, and it brought back those memories of my youth. The film went into the quirks and paranoia of Fischer, which is today well documented and known, but for me, a kid from Queens, I had no idea. All I knew was that Fischer had to beat Spassky. And Fischer did, most gloriously and dominantly. Posted in Geo-politics, Others and tagged Bobby Fischer, Bobby Fischer Teaches Chess, Boris Spassky, Manhattan Chess Club, Reyk, World Chess Championships. Bookmark the permalink.